65: One Year Anniversary! published on June 6, 2016 Read more posts by the author of 65: One Year Anniversary!, ReinCrow10 Comments on 65: One Year Anniversary! New readers: to fully understand this strip, you may want to read from the beginning. Most people who do this seem to enjoy it. I registered reincrownation.com a year ago today (June 6th, 2016). I drew the first two strips that day or the day before, and would have posted them as soon as the domain was registered. I had done the lettering by hand (I’ve since gone over that), and I was using straight html and thinking about building the website myself. I had the two strips and links back and forth before deciding to use WordPress. Really though I had been thinking about it for over a year by the time I started. I used to teach at a school in a fairly rural environment, and there was a long stretch of road between the freeway and the school. There were tracks on one side, and farms on both. But on my side of the tracks I’d see all these magnificent oak trees, and a fair share of crows. I don’t remember specifically where the idea of Reincrownation came from, but I’m sure it had something to do with that drive, and once I started thinking about it I couldn’t stop, usually while driving that long stretch of road. I had most of the early strips written, if only in my head, before I seriously got started drawing. I’ve had lots of other ideas for webcomics, a few of which are still in my head. Mostly they’re about more serious things. I’m not sure why Reincrownation is the one I simply had to do. I was once asked if I chose crows because I could draw them. The answer is no, I learned to draw crows after choosing them. Maybe someday I’ll learn to draw people and do one or more of my other comic ideas. 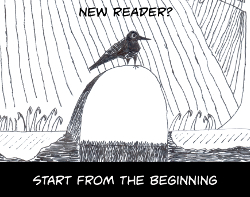 I have been told that Reincrownation is hard to get into for new readers because much of the humor is self-referential. I do see this as a reward for long-term readers, and it is something of a source of pride as generally speaking it is the mark of more intelligent humor and story telling. However, I don’t want to alienate new readers whose first strip doesn’t make any sense unless you’ve read number 23, which they haven’t, so they don’t get it and simply close the browser, never to come back. Hence the little disclaimer. Anyway, one year! I can’t believe I’ve been doing this for a full year, or that I’m still doing it. So much has changed in my life in that time. Thank you so much to the readers, especially those of you who leave comments. When I’m having a bad day, seeing my traffic increase and reading those comments is what gives me the strength to get through the day and go home and draw. Happy Anniversary! I hope you have plenty more in the years to come. Ooo, a bottle cap. What Crow is going to do with it? He could use it as a Frisbee or maybe a hat. He will need that bottle cap for when Fallout becomes real haha. Happy anniversary! Been here since before the beginning if that’s possible to say lol. By 12 months of age your comic should be able to stand while holding onto furniture, clap it’s hands, explores stuff with it’s mouth, can say “dada” or “mama” and a few other simple words, and is probably ready to begin feeding itself with a spoon. Congratulations! Thanks! Uh-oh…does that mean in a year it’ll start throwing temper tantrums?